(ghee-sugar-wheat chapati)? 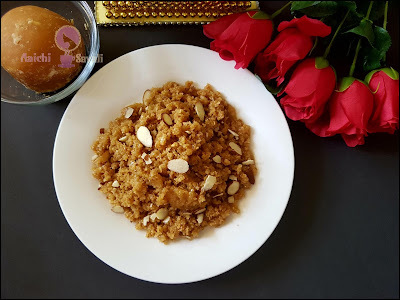 I love Tup-Sakhar-Poli and If you like it, I am sure that you will also love this healthy, hassle-free and tempting dessert. I grew up eating it. 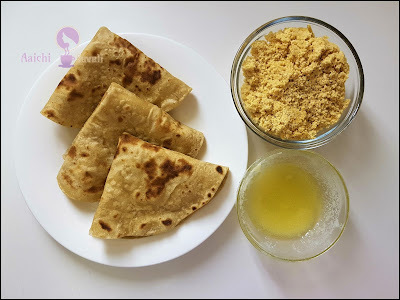 Malida / Maleeda is sweet made with whole wheat flour, jaggery / gul, ghee / clarified butter and dry fruits. It is usually made on religious and auspicious occasions. At my home, it's mainly prepared on the day of rangpanchami as a prasadam or offering to God. It’s nutritious, healthy and delightful dessert. The addition of Jaggery and nuts to the Malida increases the nutritional value of this sweet. Jaggery has the ability to cleanse your body, helps in digestion and also contains iron that can help to avoid the risk of anemia in all age groups. Each serving of Malida contains 150 calories. In a grinder add chapatis, jaggery, ghee and grind it, that will help you to mix all the ingredients very well. Garnish with dry fruits and quick, sweet and healthy dessert, malida is ready to serve. Enjoy!!! 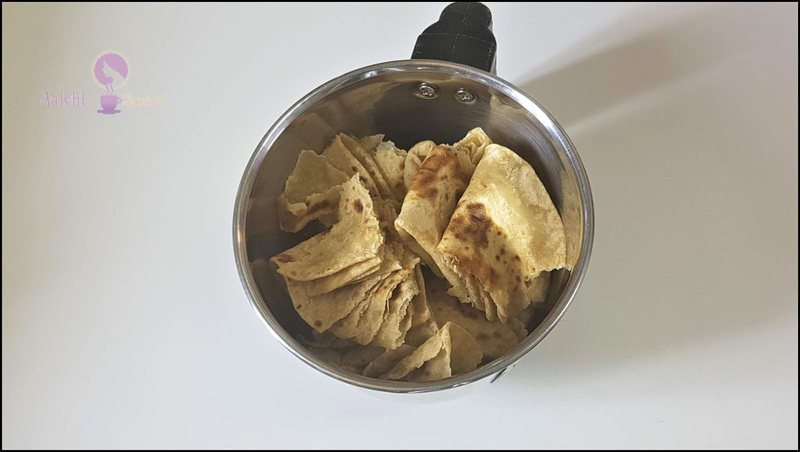 I have used fresh chapatis, you may use leftover chapatis too. Instead of ghee or butter, you can use 2 tbsp milk too. To make a vegan version just replace ghee by adding coconut oil or coconut milk. It makes 4 servings. Based on a 2000 calorie diet. Per serving contains 150 calories, along with carbohydrates - 27.5 g, dietary fibers - 2.88 g, fats - 8.15 g, proteins - 3.2 g.
Fiber: wheat and jaggery is an excellent source of fiber. It provides 3 g of fiber per serving. Low in fat: Wheat fits well in a low-fat diet. It has no saturated fat and cholesterol. It is a power packed cereal which has all the essential vitamins and minerals. It also has a very low glycemic index. Anti-inflammatory properties: It has anti-inflammatory properties and hence is very useful in chronic inflammatory diseases such as osteoporosis, diabetes or heart diseases. It provides instant energy, as it is high in carbohydrates. It helps to prevent constipation, by activating digestive enzymes, which helps in digestion of food. It is good to eat malida as a dessert or snack.